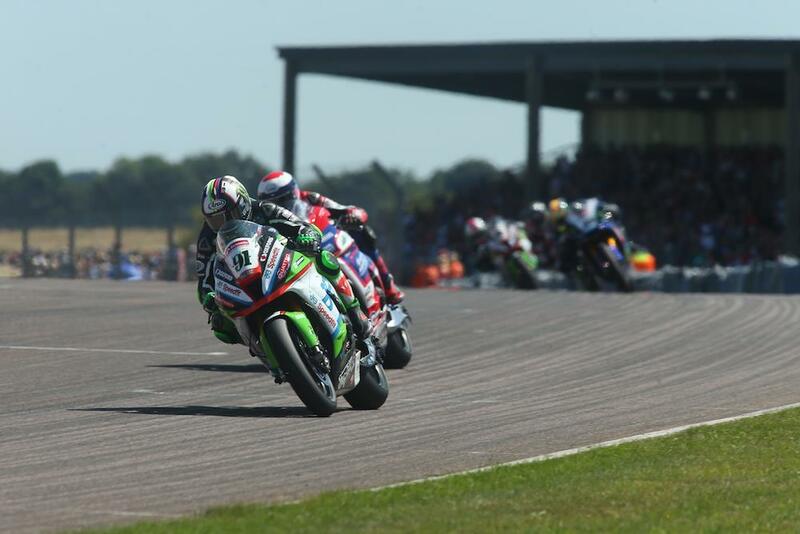 Leon Haslam extended his Bennetts British Superbike Championship lead with his first ever win at Thruxton in a dramatic opening race. Opting for the harder, optional Thruxton-special tyre – Haslam was in the lead group throughout before getting the better of fellow Kawasaki rider Jake Dixon for the win in the closing stages. It was Luke Mossey who bolted off the line to lead in the early stages, but the Cambridge rider’s pace would drop off a cliff as the race reached half distance leaving Dixon, Haslam, Brookes and polesitter Glenn Irwin to fight it out at the front. Drama struck in the opening laps as Bradley Ray tucked the front at the chicane collecting Danny Buchan and Michael Laverty, while Andrew Irwin was also a faller on the Be Wiser Ducati. All equal on pace, the race looked to be between Dixon, Haslam and Brookes with Irwin dropping off in the closing stages, but a moment for Brookes coming onto the back straight saw the Aussie lose ground. Dixon looked to have the better of Haslam, until the JG Speedfit Kawasaki drafted him on the run to the final chicane before holding his line to take a crucial 25 points. After Brookes’ moment, Honda’s Jason O’Halloran managed to slip past his countryman but an aggressive move from the Yamaha man at the chicane saw them both off the track, allowing Peter Hickman, who had returned from hospital just two hours earlier, to sneak through and complete the rostrum. Brookes was able to maintain fourth, but Irwin slipped past O’Halloran to take fifth. Early leader Mossey crossed theline seventh ahead of an impressive ride for Team WD40’s Mason Loaw with Tarran Mackenzie and Chrissy Rouse rounding out the top ten. Luke Mossey starts on pole position for the second race ahead of team-mate Leon Haslam and Jake Dixon.